William Nathan Hinshaw8 [Nathan Hinshaw9,10]. Henshaw, Nathan, boarder, age 15, born in Tennessee; parents' birthplaces unknown; farm laborer; cannot read or write. He married Emma Jane Young, Dec 11 1890, Franklin County, Tennessee.8,10,11 Emma, daughter of Isaac Young & Mary Susan Holder2,3,7,8,14, was born Feb 19 18692,3,7,8,14 [Feb 15 18694,15], Tennessee2,3,7,8,14. 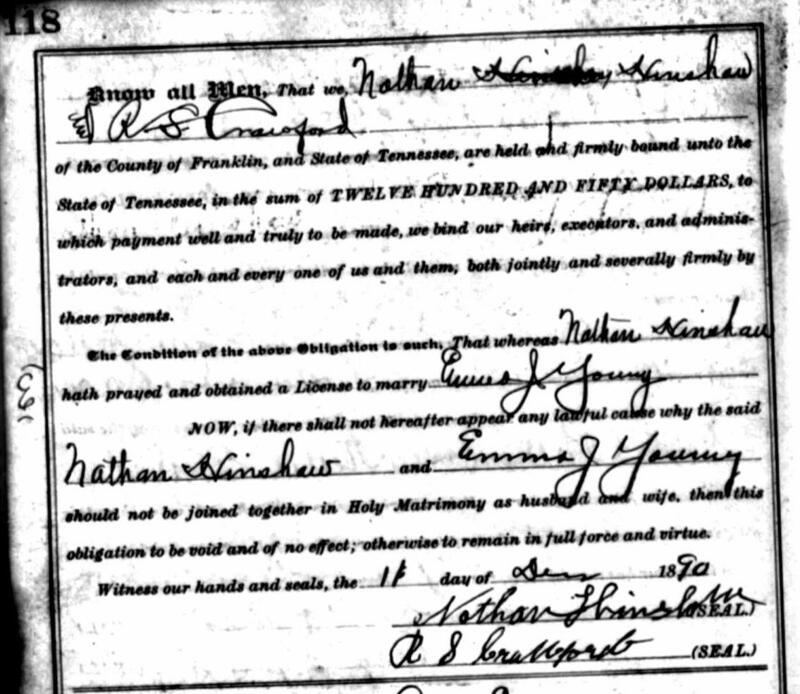 Hinshaw, Nathan, head-of-household, age 36, born Oct 1863 in Tennessee; parents born in Tennessee; married 9 years; [..occupation unclear..]; rented farm. Hinshaw, Emma, wife, age 31, born Feb 1869 in Tennessee; parents born in Tennessee; married 9 years; 2 children, 2 living. Hinshaw, Pauline, daughter, age 8, born Aug 1891 in Tennessee; parents born in Tennessee; attended school 2 months. Hinshaw, Floyd, son, age 6, born Mar 1894 in Tennessee; parents born in Tennessee. Hinshaw, Emma J., head-of-household, age 41, born in Tennessee; parents born in Tennessee; widow; 5 children, 5 living; occupation: farmer, general farm; owned farm (free). Hinshaw, Pauline S., daughter, age 18, born in Tennessee; parents born in Tennessee. Hinshaw, Floyd K., son, age 16, born in Tennessee; parents born in Tennessee; occupation: farm laborer, home farm; attended school. Hinshaw, Herman A., son, age 9, born in Tennessee; parents born in Tennessee; occupation: farm laborer, home farm; attended school. Hinshaw, Ollie E., daughter, age 7, born in Tennessee; parents born in Tennessee. Hinshaw, Joe J., brother-in-law, age 48 [unclear], born in Tennessee; parents born in Tennessee; single; occupation: farm laborer, home farm. Hinshaw, Emma, head-of-household, age 50, born in Tennessee; parents born in Tennessee; widow; owned home; occupation: farmer, general farm. Hinshaw, Pauline, daughter, age 28, born in Tennessee; parents born in Tennessee; single; occupation: none. Hinshaw, Floyd, son, age 25, born in Tennessee; parents born in Tennessee; single; occupation: laborer, [..unclear..]. Hinshaw, Herman, son, age 19, born in Tennessee; parents born in Tennessee; single; occupation: farm laborer, home farm. Hinshaw, Ollie E., daughter, age 16, born in Tennessee; parents born in Tennessee; single; attended school. Hinshaw, May, granddaughter, age 7, born in Tennessee; parents born in Tennessee; single; attended school. Henshaw, Ema J., head-of-household, age 61, born in Tennessee; parents born in Tennessee; widow; owned home; no radio in home; occupation: farmer, [..unclear..] & dairy. Henshaw, Ollie E., daughter, age 27, born in Tennessee; parents born in Tennessee; single; occupation: none. McKinney, Ernest, head-of-household, age 34, born in Tennessee; completed 3rd grade; on Apr 1 1935 was living in the same place; owned home ($400 value); occupation: farming, farm. McKinney, Ollie, wife, age 37, born in Tennessee; completed 1 year of high school; on Apr 1 1935 was living in the same place. Hinshaw, Joe, father-in-law, age 78, born in Tennessee; completed 2nd grade; on Apr 1 1935 was living in the same house. Hinshaw, Emma, mother-in-law, age 70, born in Tennessee; completed 8th grade; on Apr 1 1935 was living in the same place. Contribution from Larry King Hinshaw citing: personal knowledge. 1920 census, Franklin County, Tennessee; roll T625-1739, ED 30, page 3A, line #40, dwelling #48, family #49. 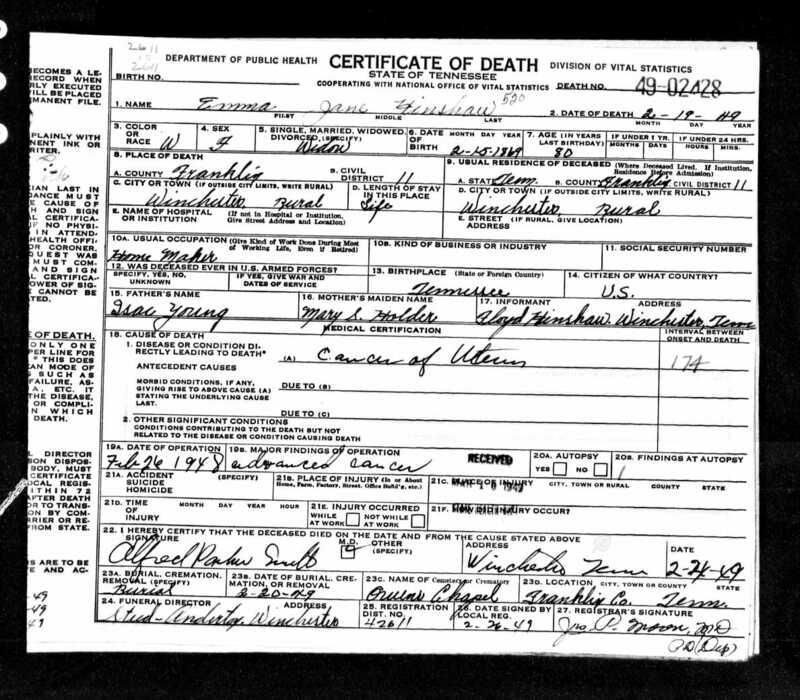 Tennessee Death Records, 1908-1959; http://www.ancestry.com. Obituary of Herman Arthur Hinshaw. 1930 census, Franklin County, Tennessee; roll T626-2246, ED 14, page 4A, line #1, dwelling #57, family #61. Contribution from Larry King Hinshaw citing: Young family bible records. 1870 census, Winchester P.O., Civil District 5, Franklin County, Tennessee; roll M593-1527, page 75, line #18, dwelling #29, family #29. 1880 census, 11th Civil District, Grundy County, Tennessee; roll T9-1258, ED 41, page 269B, line #21, family #79. 1940 census, 11th District, Franklin County, Tennessee; roll T627-3891, ED 26-14, page 2B-3A, line #79, household #36. 1910 census, Civil District 11, Franklin County, Tennessee; roll T624-1499, ED 30, page 154B, line #84, dwelling #56, family #57. 1930 census, Franklin County, Tennessee; roll T626-2246, ED 14, page 4A, line #3, dwelling #57, family #62. Contribution from Larry King Hinshaw citing: obituary.